Office Serv7100 Business Phone Systems Albany NY | Samsung Phone Systems Albany | Allied Telcom | Allied Business Systems	| Allied Business Communications, Inc.
Samsung wireless communications and digital technology experts have engineered an easy-to-install, economical, business communications solution with converged IP capabilities and performance built right in. 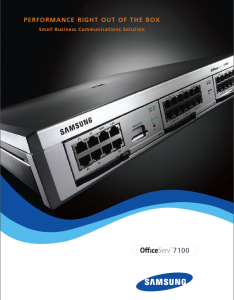 Now small businesses can plug into the power of convergence with the OfficeServ 7100. A single compact, platform links wireless and wire line connections, voice and data – providing connectivity and substantial cost savings from all-in-one technology.